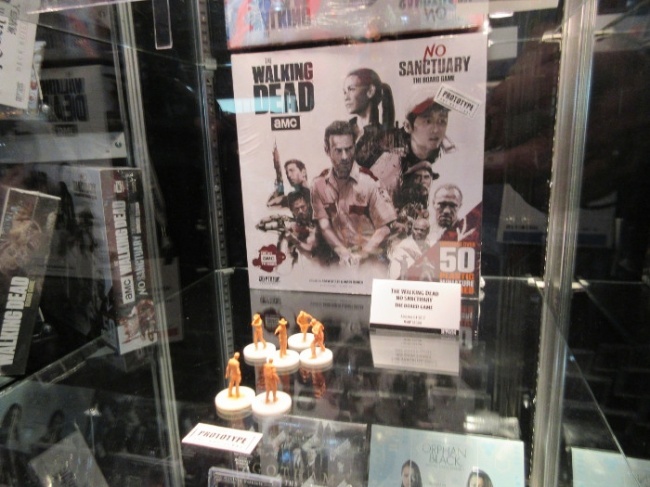 At New York Toy Fair, Cryptozoic Entertainment was exhibiting upcoming games including two Rick & Morty titles, Crossover Crisis Animation Annihilation, Attack on Titan – The Last Stand, The Walking Dead: No Sanctuary and more. “In the game you play as a builder, and you're trying to build the best theme park inside this homeless man's body,” Sblendorio said. “It's a tile laying game, but you're building rides, attractions, food vending stations, and trying to point by building the best one. The caveat, though, is the more you move tiles around, you're causing bodily functions to go awry.” Release is planned for July. MSRP is $30.00. 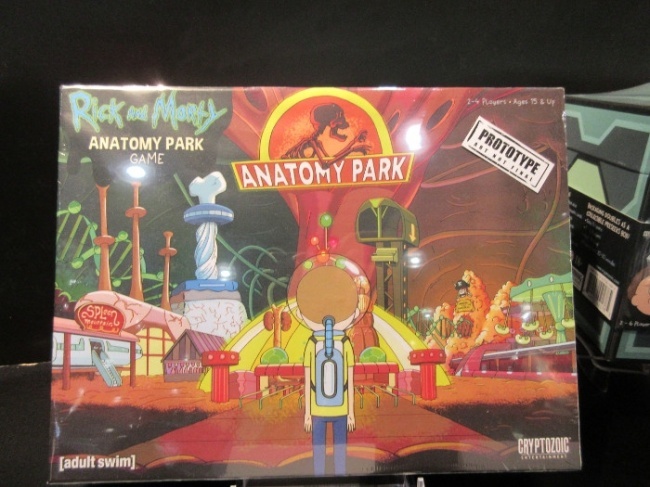 The second game is based on the Rick and Morty episode Close Rick-Counters of the Rick Kind. The game will be a deck-builder using the Cerberus Engine as a foundation, but with Rick and Morty’s twists and methodology added in. Release is planned for Q4. MSRP is $40.00. 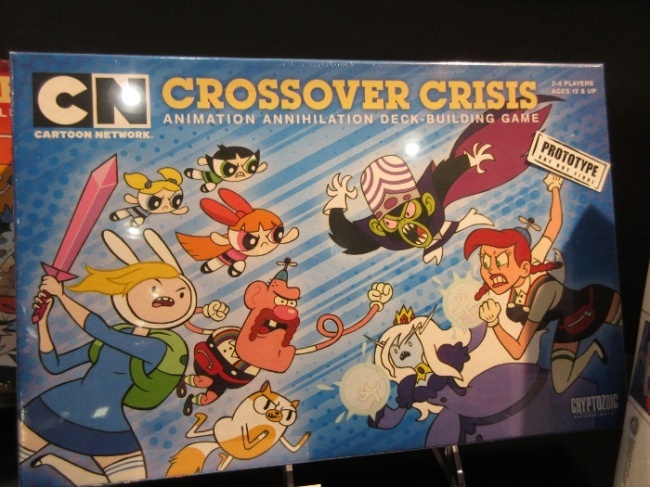 Crossover Crisis Animation Annihilation is a follow-up to the Cartoon Network Crossover Crisis Deck-Building Game (see “Cartoon Network, Cryptozoic Create 'Crossover Crisis'”). The new stand-alone game features Fionna and Cake from Adventure Time, The Powerpuff Girls, Uncle Grandpa, Ed, Edd, n Eddy, Billy and Mandy, and Cow and Chicken. Release is planned for Q3. MSRP is $40.00. Attack on Titan – The Last Stand has been in development for a while (see “'Attack on Titan,' 'Rick and Morty,' More”). Designed by Antoine Bauza and Ludovic Maublanc the game pits multiple players against one player who represents the Titan. 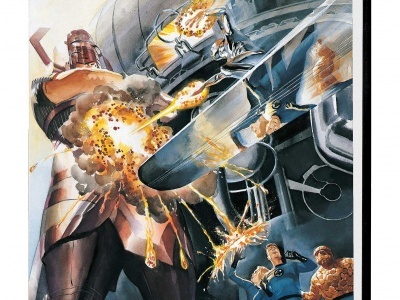 Players must coordinate their positions in order to deliver a killing blow to the massive Titan. Meanwhile, the Titan is trying to destroy the tower and the supply depot and eat enough civilians to win the game. Release date and MSRP were not announced. 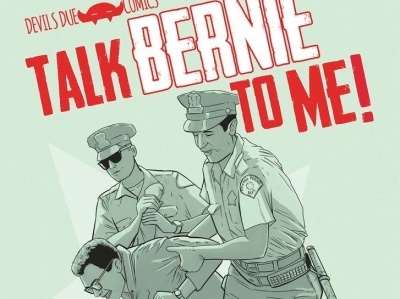 “It's all about trying to get from point A to point B, and then to the next, and then the next, and the next, playing through campaigns that mirror the storyline of the show. The challenge is in how you're able to work with each other, with what you have, in order to succeed.” Release is planned for Q4. MSRP is $80.00. Master of Orion: The Board Game is a competitive tableau-building game that debuted at Essen last fall (see “'Master of Orion' Brings Classic PC Game to Tabletop”). Release is planned for Summer. MSRP is $35.00. Train Heist is a cooperative game by Sean McDonald (see “Right Wrongs and Rob Trains in 'Train Heist'”). “It's actually championed by the retailers. 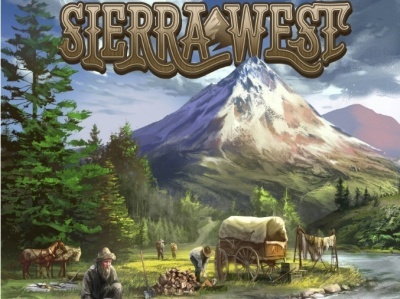 A couple game stores had asked us about the possibility of ever getting that game back into print or getting more out there,” said Sblendorio. “Here we are a year later, and we're going to be putting it back out there for more people to play. It's a great co-op.” Release is planned for May. MSRP is $45.00. 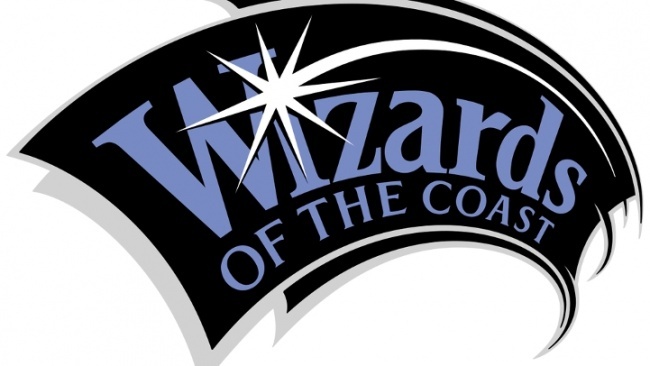 “Our third Epic Spell Wars is in development right now, Epic Spell Wars of the Battle Wizards, Melee at Murdershroom Marsh,” Sblendorio said. “Like Rumble at Castle Tentakill, this is fully compatible with the previous editions. It adds a few unique aspects in its own right.” Release is planned for Q4. MSRP is $30.00. 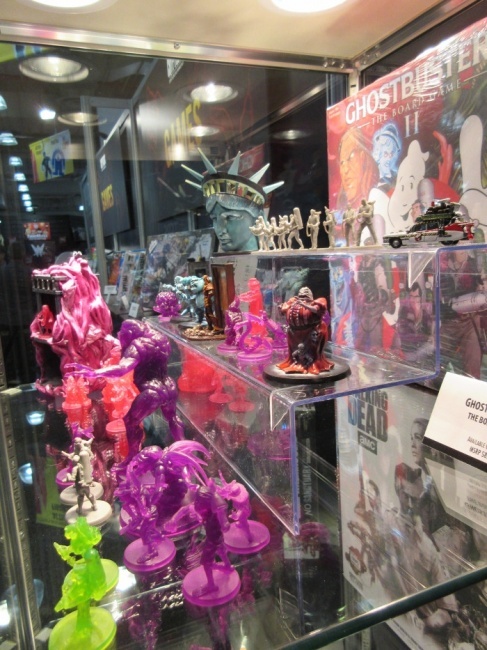 Ghostbusters II was Kickstarted last year (see “Preview: 'Ghostbusters: The Board Game II'”). 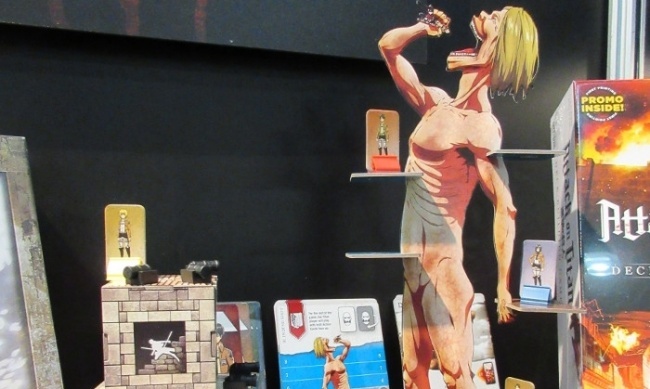 “This is the first time a lot of the complete components are being shown, at least the physical miniatures,” Sblendorio said. “We wanted to show a mix of how they're going to arrive, either gray or in their translucent color, then we had a local artist do some painting to show off the amount of detail that is in the sculpts, themselves.” Release is planned for Q3. MSRP is $85.00. See images of games and components in the gallery below!